Liza Pullover, like everything else I design, is something I would wear myself. As a result, it is the reflection of my own rather casual style. 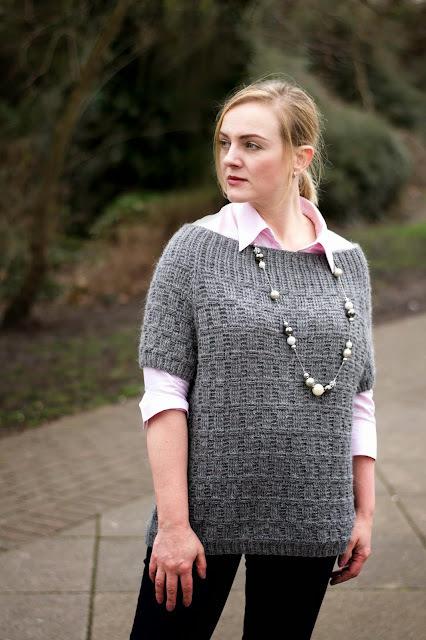 I hardly ever wear fitted clothing, regularly raid my husband’s wardrobe and love relaxed oversized knitwear (crochetwear? :)) as part of a layered look. But I do see how this may not be your style and how you might want to change a thing or two. Over the year I received a few questions on how to modify Liza pullover, so I felt like it might be a good idea to organise my thoughts into a couple of blog posts, just in case they might be helpful to other crocheters adventurous enough to alter the pattern. There are a number of ways you can change this sweater. Some are fairly straightforward, others are less so. While I cannot recalculate and rewrite the pattern for every possible scenario, I am hoping to be able to give you a few useful pointers in case you are up for it. First of all, let me explain why I opted for this wide neckline in the first place. Apart from my personal preferences (the casual look mentioned above), there were certain considerations from the designing point of view which made this neckline a preferred choice for me. I always start with the stitch pattern, the fabric and the texture. This is the first most important part of any of my designs and it determines the rest of it. If any particular element requires breaking the continuity and the logic of the stitch pattern to the point that it stops looking neat, I discard that element. I love the basket weave stitch pattern I used to make Liza. However, it does not look as neat and uniform, when worked back and forth in rows, rather than rounds, so the first determinant of this design is that all rounds are worked in the same direction, which results in this lovely uniform texture. A tighter neckline, such as a crew neck, would require raising the back an inch or so by working a few short rows. Although it is quite common not to do so in many crochet garment patterns, I personally find a sweater without a raised back a bit uncomfortable to wear, since it keeps slipping back and I constantly find myself pulling it down on the front. To work short rows in the same directions would mean cutting yarn at the end of each row, reattaching it again for each of the short rows worked. Keeping it simple is the second consideration of my designing process, and just the thought of having all that extra fiddling with placement of the short rows and extra ends to weave in (not to mention figuring out a sane way to describe it in the pattern), was enough to put me off the idea of a tighter neckline. There were a couple more things I needed to consider (such as being able to grade the sweater in a number of sizes), but I won’t bore you with those, since the reason you have got this far reading this blog post is probably because your heart is set on a crew-neck or a narrow turtle neck, and a lack of the raised back doesn’t bother you. Or least bothers you less than a wide neckline. 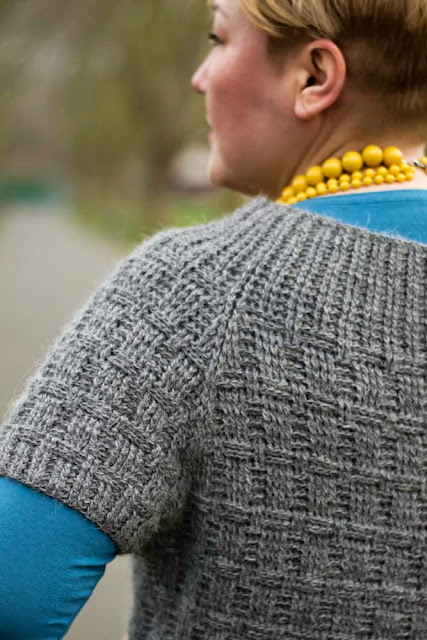 The quick and easy option would be to go for your chosen size (see this post on ease), but slightly widen and tighten the neckline ribbing at the top, as demonstrated in this project by patricialeeross on Ravelry. I find this solution rather intriguing as it brings to mind this gorgeous sweater by Courtney Spainhower from the latest issue of Pom Pom Quarterly. In the project linked to above (see the bottom photo) the ribbing was decreased and extended in the opposite way after the sweater was finished, but you could work it top down right from the start and try it on as you go. This option renders all of the yoke calculations I have done for you in the pattern pretty much irrelevant and would mean having to redo them yourself. If you are friends with maths, why not? Waifmtl's “Liza pullover” on Ravelry is a successfully executed example of this modification. Changing the neck circumference will mean a different rate of increasing near the raglan lines to arrive at the desired number of stitches around the bust and the arms, so you will need to figure out how many stitches you will need to start with, how many to add, how to distribute the increases over your preferred yoke length and what that yoke length should be. You could also start your calculations with the number of stitches you need in the bust and sleeves and work your way backwards to the number of neck stitches. Both the bust and the arm circumferences are affected at the same time, so you need to balance both. The neck ribbing stitches need to be divisible by three [2 FPdc, 1 BPdc]. Four of the ribs are the raglan lines, which create the faux seams, and increases are made on both sides of those. There are eight stitches added in each increase round, four of them add width to the body, two to one sleeve and two to the other. As a reference, in the original pattern the increases are distributed evenly over the length of the yoke. In size 3X they are made in every round. In sizes S (M, L, 1X, 2X) every third (third, fourth, fifth, sixth) round is worked evenly (no increases are made). You will be adding extra chains under the arms (“bridges”) when joining the body and those provide a bit of leeway when balancing the stitch patterns. These extra chains add width to both the bust circumference and the armscye, so don't forget to take them into account in your calculations. If after you have finished the yoke and added the bridges the total numbers in the body and sleeves are not divisible by 6 (necessary for the basket-weave stitch pattern), you can add faux seams (2 FPdc) on the sides of the body and underarm on the sleeves to cover up the incomplete pattern repeats. Hope these notes are of help!